The “Rainscanner” is designed as an affordable area scanning precipitation indication system. The “Rainscanner” indicates precipitation areas, and classifies precipitation into levels. Comparing radar with rain gauge data gives improved quantitative rain rate estimations. The maximum range of operation varies between 50 km and 100 km, depending on environmental and meteorological conditions, e.g. intensity of precipitation. Simplicity and ease of use are the primary design features, permitting fast installation, radar control and data handling. The transmitter is capable of approximately 25 kW power output, ideal for operation at ranges between 50 and 100 kilometers. The “Rainscanner” consists of a scanner unit, interface unit and signal processing unit. 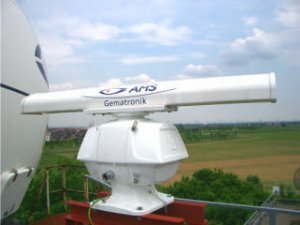 The scanner unit contains the transmitter, receiver and antenna units, that can be mounted on a fixed installation (building or mast). Antenna Data are feed directly from the scanner unit to the Rainscanner Workstation via an antenna cable (max. length 30 m). The Rainscanner workstation comprises the interface unit and a robust industrial Signal Processing PC. Data display as well as product and data archiving are provided with the real-time visualization software RainView, based on the software package Ravis. The real-time radar system and data visualization software Ravis forms an essential components of the full-size METEOR Weather radar series. Data transfer between the Rainscanner Unit and the remote RainView PC can be provided via ISDN, WLAN, Fibre Optics, etc. The antenna and pedestal combination is designed for exposed outdoor operation. Fast antenna scans provide quick updates of atmospheric situations. The modular design offers 2 reflector types, yielding in beam width of 1° to 4° degrees. Depending on the reflector size and the environmental conditions, a suitable radome is available. The Fan Beam Antenna is a slotted waveguide design which provides a fan beam shape The antenna position is measured with two signals, the north reference pulse (NRP) and the azimuth change pulse (ACP). During the installation the scanner unit will be adjusted with respect to the north direction, with the help of a compass. After installation, the true north antenna position can be fine tuned with a software routine. 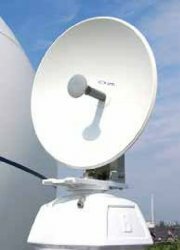 Improved resolution in azimuth and elevation can be achieved with the parabolic antenna solution. The narrow pencil beam provides an improved data resolution in azimuth and elevation. The “Rainscanner” Signal Processing PC is available as a standard PC or an Industrial Computer. The Signal Processing PC is equipped with a high performance, high speed Analogue-to-Digital Converter card and a digital I/O card. An Analogue-to-Digital card samples the IF signal and transfers the data into the computer memory for data processing. The computer communicates with the Radar Interface Unit via RS232 interface. An Industrial Computer is a PC in a 19\' rack form factor. It has a flat panel display as user display integrated as a drawer together with the keyboard. The Radar Signal Processor is equipped with a Fast Ethernet interface allowing remote control of the entire system.